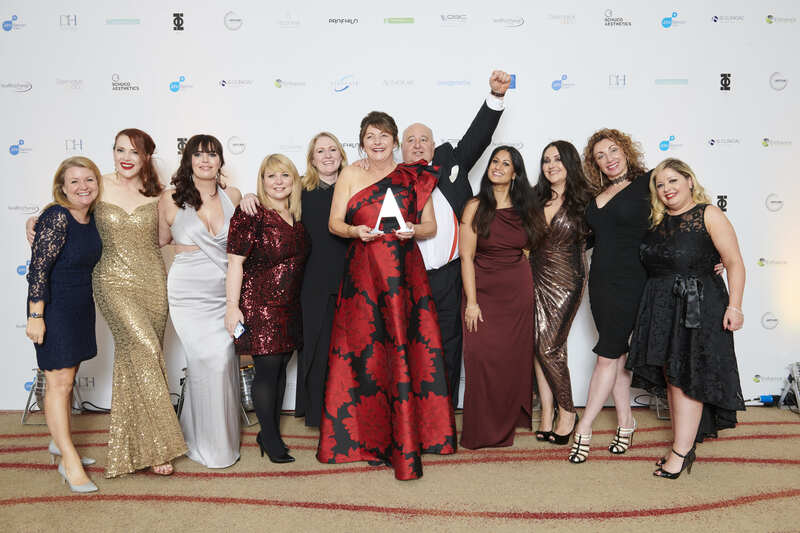 This award will be given to the manufacturer or exclusive UK distributor of the best skin product or range offered in UK medical aesthetics clinics. The judges will select finalists who show evidence that their product is effective, safe, easy-to-use and well accepted by patients. Injectables and devices are not eligible for entry in this category and should enter either ‘Injectable Product of the Year’ or ‘Energy Treatment of the Year’. The winner will be selected from the finalists using a combination of Aesthetics reader votes and judges scores. Voting will constitute a 30% share of the final score. Please note that the word count for each question is inclusive of references. NeoStrata Skin Active Tri Therapy Lifting Serum should be Skin Product of the Year because incredibly impressive results are seen extremely quickly. In addition to the usual 4, 6, 8 and 12 week clinical studies (attached), Dr Sophie Shotter (independent doctor, not affiliated with the brand) activated a case study whereby the patient kept her regime as the same and only added in one product – Tri Therapy Lifting Serum and impressive results were seen in as little as four weeks. Please refer to the Supporting 1 for Visia Evaluations. This showcases the power of this product and how it improves skin health. Tri Therapy lifting serum has also been featured in more ‘Editor’s Choice’ pages than any other NeoStrata product, including being a favourite of Lorraine Candy, editor of Sunday Times Style and Polly Vernon, editor-at-large at Grazia. It is also up for 3 consumer awards. The comprehensive range of Obagi products known for minimising signs of premature skin aging, sun damage, hyperpigmentation, melasma and acne, reliably helps patients achieve healthy skin. For OVER 30 YEARS Obagi remains THE GOLD STANDARD in aesthetic skincare. Before and After photos demonstrate Obagi UNIQUELY revolutionising all skin types, TREATING DIFFICULT CONDITIONS e.g. melasma, with a SIMPLE numbered topical system. EXTENSIVE CLINICAL TRIALS underpin clinically proven ingredients being uniquely combined into clinically proven systems delivering outstanding patient results. 25+ clinical papers and posters PROVE EFFICACY AND RESULTS. Obagi stands out! CLINICAL STUDIES examine the products in their entirety - not just the isolated ingredients meaning, unlike any other, with Obagi you can be confident that it works and isn’t simply well-known industry ingredients re-branded. SUPPORT AND EXPERT ADVICE for prescribers and their clinics is readily available from a team with clinical, educational and marketing/PR expertise plus an unparalleled, and uniquely doctor-led, expert medical directorate is on-hand to assist. PATIENTS ADORE OBAGI. Well-loved by professionals and public alike, Obagi has STRONG SOCIAL-MEDIA PATIENT, PEER AND PRESS ENDORSEMENT. STRAIGHTFORWARD PATIENT-LED ONLINE TUTORIALS accessible 24/7 mean patients need less clinic time. SIMPLE NUMBERING (1 TO 6) and EASY TO FOLLOW instruction cards/videos make using Obagi a stress-free daily routine. Healthxchange and Obagi fully back all product claims giving doctors CONFIDENCE IN PRESCRIBING products that ACHIEVE GREAT RESULTS. This combined with GLOBAL INDUSTRY ACCOLADES ensure Obagi offers WELL-REGULATED PRODUCTS with claims you can TRUST. Heliocare is a multi-award-winning daily use sun and anti-oxidant skin protection range. It’s clinically proven to protect the skin and prevent skin ageing with a range of advanced formulations that encourage daily use, leaving skin feeling beautifully soft and hydrated. The very latest range, Heliocare 360°, provides SPF50 broad spectrum protection from UVA and UVB, and also protects against visible light and infrared-A. But Heliocare 360° is so much more than just a sunscreen. With the addition of the unique and powerful anti-oxidant Fernblock FC (supported by over 80 clinical papers) and DNA repair enzymes too, it’s an essential addition to every skincare regime. With a full range of formulations, from tinted options and compacts for use on the go, to oil-free and mineral products, there’s a Heliocare 360° to suit every skin type. But more than that, every client will find a product that they love to use as part of their skincare regime every single morning. This is one of the many reasons that Heliocare continues to grow in popularity, brand loyalty and awareness from both skin professionals and consumers alike. Heliocare 360° is not only recommended by professionals, but has a huge celebrity/influencer following and is regularly mentioned in the press including glossies such as Glamour, Harper’s Bazaar, Cosmopolitan and Marie Claire. Featuring regularly, and unprompted on blogs, vlogs and social media posts, Heliocare is helping to raise awareness of the dangers of sun damage all year round – fans include Trinny Woodall, Poppy Delevingne and Sienna Miller… plus a throng of influential skincare bloggers. Epionce was created by clinical dermatologist Dr. Carl Thornfeldt who is extremely passionate about skin and skin health. Epionce is rooted in hard science and integrates over 20 years of clinical skin research. The Epionce philosophy is simple: healthy skin is beautiful skin. The unique Epionce approach paired with industry-leading clinical proof has been trusted by medical professionals for over fifteen years. Epionce is formulated to help unleash the natural potential of your skin. Epionce has a UNIQUE approach which provides a blend of key botanical ingredients to reveal healthier-looking skin that can help improve the visible effects of ageing. The gentle and effective formulas are paraben, fragrance, sulfate and gluten-free. Unlike many other products on the market, Epionce does not contain harsh ingredients that irritate the skin or cause unnecessary dryness. The iS Clinical range is a clinically proven, peer reviewed, acclaimed portfolio, representing one of the most successful cosmeceutical offerings within the USA and rapidly gaining demand in the UK together with a reputation for efficacy and results. Botanically derived, pharma grade and proven capability, the iS Clinical range has secured a prestige positioning and distribution to become the fastest growing, most luxury clinical ranges in the UK market with over 150% year on year growth. Aspirational and results driven, it is one of the very few clinical brands that transcends across the luxury consumer & clinical press with its esteemed positioning and credence to bring a dynamic offering to the market. The range features a comprehensive professional, treatment and retail portfolio which integrates seamlessly with current device and machine led treatments. The highly effective formulations treat skin conditions such as Acne, Hyperpigmentation, Scar management and Rosacea as well as offering exceptional results within the Anti Ageing market, Cancer Care, Post Procedure and Recovery market. Oxygenetix is the ultimate post treatment foundation, providing premium coverage with unsurpassed skin health boosting benefits. No other brand of camouflage makeup on the market allows the skin to breathe and look natural even after multiple layers are applied. Oxygenetix is the only post treatment foundation that can be used on broken skin and covers redness, pigmentation and scarring. Originally Oxygenetix was developed to heal and conceal skin after cosmetic surgery and cosmetic procedures such as laser and peels. Oxygenetix foundation takes away the social downtime of aesthetic procedures, making sure patients can get back to their normal lives. Eliminating social downtime can also help doctors and specialists to book in more procedures as treatments are not limited to Friday afternoons! Many cosmetic procedure results are dependent on before- and after-surgery protocols. The best outcomes occur when doctors’ pre- and post-operative treatment instructions are followed and Oxygenetix Foundation is used daily to cover and protect the skin. Oxygenetix is the world’s most breathable post treatment foundation. Celebrities love Oxygenetix foundation on photo shoots and movie sets because it doesn't turn into a melted mess under the hot lights. The foundation remains in place for hours, and there is no need to touch it up all day long. The longer Oxygenating Foundation is worn, the healthier, firmer and plumper the skin will become. Actresses Kate Bosworth, Emilia Fox, Actor Hugh Jackman, singer Jess Glynne, model Poppy Delavigne, and influencer Kourtney Kardashian are all huge fans. Crystal Retinal is a revolutionary serum-cream powered by retinaldehyde, an advanced vitamin A molecule that serves as the direct (one-step) precursor to retinoic acid. When ordinary retinol is applied to the skin, it must be converted to retinaldehyde and then to retinoic acid before it can take effect on the skin. Retinaldehyde, on the other hand, only requires one conversion to retinoic acid. Crucially, this last step is extremely rapid compared with any previous steps. This means retinaldehyde can can deliver results comparable to clinical-grade vitamin A, up to 11x faster than classic forms of retinol. Fine lines and wrinkles are visibly diminished, mottled pigmentation is smoothed and skin texture is refined. In addition, Crystal Retinal remains as kind to the skin as traditional retinol thanks to Medik8’s crystal-shaped encapsulation system: retinaldehyde is encased within a crystal-shaped molecular vehicle that is then broken down by the skin’s natural enzymes upon contact. This unique action allows retinaldehyde to be delivered slowly and evenly throughout the night which helps to minimise the irritation that is generally associated with vitamin A. Unlike many other forms of vitamin A, retinaldehyde also boasts powerful antibacterial properties, making it the perfect anti-ageing product for blemish-prone skin. Over time it is able to tackle blemish-causing bacteria (P. acnes) to promote an even, blemish-free complexion. The SkinCeuticals Antioxidant Range is the pioneer in topical antioxidants and has set the industry standard thanks to strict formulation parameters, antioxidant synergy for enhanced efficacy and demonstrated biological and clinical proof. This potent range is the result of critical anti-ageing breakthroughs in protection from environmental aggressors which cause premature skin ageing. The range has evolved from over 4 decades of research initiated by SkinCeuticals founding dermatologist Dr Sheldon Pinnell. He first demonstrated that Vitamin C can be effectively absorbed by the skin to reinforce natural environmental protection and developed parameters to ensure maximised biological action in skin. Continuous research and development ensures the range provides a comprehensive approach against atmospheric skin ageing; for example C E Ferulic is proven to increase skin’s natural environmental protection by up to 8x and prevents oxidative damage caused by UV and IRA exposure. The range can also be integrated into procedures and treatments performed in-clinic to speed up recovery time. C E Ferulic: patented triple antioxidant serum for normal to dry skin. It leaves skin looking firmer and brighter. Phloretin CF: a triple antioxidant serum for combination to oily skin, that improves skin tone. Phloretin CF Gel: the same antioxidant combination as Phloretin CF but in a concentrated antioxidant gel for easy application. Serum10: an introductory antioxidant for new Vitamin C users. AOX+ Eye Gel: a patented antioxidant formulated to protect the delicate eye area. Resveratrol BE: a night-time concentrate to promote skin’s natural repair and prevent signs of accumulated damage. Dubbed the ‘King of Skin’ Dr Zein Obagi is world-renowned for his work in dermatology spanning over 30 years. Pioneering the concept of ‘Skin Health Restoration’, he changed the paradigms of skincare, addressing skin concerns at a cellular rather than superficial level, putting him at the forefront of anti-ageing innovation. Following the success of his Skin Health Institute, Blue Peels and the Nu-Derm System, Obagi found a new innovation that would shape the skincare market and ZO was born. Comprising a non-medical line, ZO Skin Health and professional range, ZO Medical, the products are based on the ‘circle of skincare’. ZO works synergistically through stages, namely Daily Skincare, Protection, Therapeutic and Maintenance. For ZO Skin Health the key differentiation has always been a higher concentration of retinol compared to other over-the-counter formulations. ZO Medical takes a more advanced approach, with products five times stronger than the Skin Health range. The ranges provide innovative results-oriented skin health solutions to treat everyone seeking healthier skin and today, ZO is among the most widely regarded skincare lines recommended by experts globally. Fast-forward to 2018 and Dr Zein Obagi has been recognised for his advancements in dermatology. While he continues to practise from his three clinics, his career has taken him beyond treating patients into the laboratory, classroom and to represent innovations in skincare on a global scale. Dr Obagi’s philosophies, advanced line of products—ZO and pioneering procedures have carved an ongoing legacy and cemented him as a pioneer in dermatology and skin health. The ZO Skin Health range should be cosmeceutical product of the year as it is the most advanced and effective skincare line that tackles deep skin disease across all types of skin, whether the patient has sun damage, melasma, severe acne or advanced rosacea within fair Caucasian, complex deviated or black skin colour. ZO Skin Health has a product range and protocol that addresses all skin diseases for all skin types. It is the most effective product range that doctors and dermatologists use most frequently as it gets the best results across the board of skin type for the most severe cases of skin degradation and disease. ZENii is a new, cutting edge anti-ageing and skin health range that combines the power of clinically proven cosmeceutical skincare with nutrition and anti-ageing supplements. The dual Inside Out approach powerfully optimises cellular function at every level. We believe is the future of advanced skincare & anti-ageing. Our range is different and unique because we address the real issues that modern people face and our range provides solutions for them all. We don’t just target lines and wrinkles. That isn't true anti-ageing. We target all aspects of cellular health from the inside & out. Modern city living exposes us to regular pollution, chemicals and toxins. Urban life is rushed, busy and on the go. Many Western people have numerous, small nutritional deficits due to the highly processed Western diet, toxin exposure and soil depletion. All of these create constant and repeated cellular insults on our bodies and skin. Our skincare and supplement range work in unique synergy and help to rescue the body and skin from these daily insults - our range helps reduce free radical production, telomere shortening, damage from UV exposure, nutritional deficiency and cellular deficiency. In short the duality of our range addresses all of the issues that create cellular ageing and dysfunction. The ZENii range was created by Dr Johanna Ward a Gp and Cosmetic Doctor who has devoted her professional life to the science and study of skin health. All ingredients and clinically proven, evidenced based and sustainably sourced. Our skincare range is totally vegan and cruelty free. Our supplements are all GMP, non-GMO and gluten free. We believe that ZENii should win best cosmeceutical range because we are the only range that truly considers and combines ingredients that work from without and within to comprehensively address the critical factors in cellular ageing.